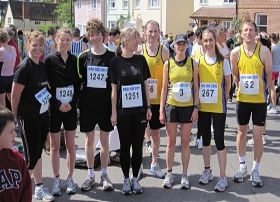 We cater for all abilities from "keep fit" to marathon and beyond. "Striders" was formed in 1989 by Gay Jeffery as a ladies club, running from the local supermarket car park! Men joined in 1990 and now, but not because of the men, we are based at the Lord Butler Leisure Centre. We meet weekly at the Lord Butler Leisure Centre at 8:00pm every Tuesday. There are also other club training sessions at various times through the year, such as circuit training on Wednesdays, and speed/hill training on Saturday mornings at the Gogs car park (just outside Stapleford). We have some favoured runs around the town and country lanes and fields (light permitting), offering a varied degree of ease or difficulty, depending on your outlook.